What is round, goes around, comes around. To us, that sums the story of the Somali Malawah (Malawax). We wish to think that the crepe originated in the Horn of Africa. The Horn is the home of the Ethiopian Injera, the Eritrean Injera, Somali Anjero or Lahoh, Malawah, and Ambaabur. It is not clear and convincing evidence, but you cannot ignore the balance of probabilities. The traditional Malawah is made with flour and water only. It is quick and easy and can be made at a moment’s notice. It is a lifesaver if the cat spills the anjero batter (a good excuse if you forgot to prepare the anjero batter the night before). 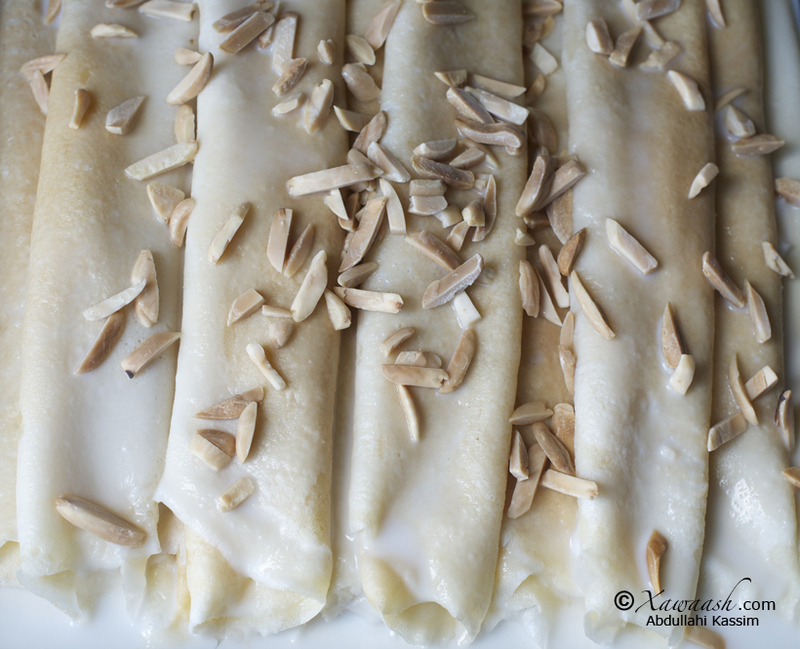 To serve it, Malawah is drizzled with ghee (subag) and sprinkled with ample sugar. This makes it great for breaking the fast in Ramadan. Malawah is also served with savoury dishes like suqaar, been dallac (dallac bilaash), and stews. It is not as absorbent as anjero but that will not be a hindrance if you are well-versed in the arts of fiteeys and rifaaqid. Fiteeys is breaking any bread (rooti, muufo, anjero, malawah) into very small pieces and combining it with a stew. This is usually done with stale bread that has somewhat hardened and is less absorbent. Rifaaqid is when you take things to a whole new level. Your hand turns into a blender and you mush the food together. You wouldn’t know what you are eating, but it tastes amazing nevertheless! Zahra Kassim gave us the recipe for the Enriched Malawah. She also gave us the idea of serving malawah with coconut milk. In her version, the coconut milk is cooked with sugar then applied to the malawah. Ce qui est rond, part faire un tour, et revient à la maison. Cette expression, pour nous, résume l’histoire de la Malawah Somali (Malawax). Nous aimons à penser que la crêpe est née dans la Corne de l’Afrique. La Corne est le berceau de l’Injera Éthiopien, l’Injera Erythréen, l’Anjero Somali ou Laho, la Malawah, et l’Ambaadur. Cela n’a jamais été établi ni prouvé, mais on ne peut ignorer cette forte probabilité. La Malawah traditionnelle est faite de farine et d’eau uniquement. Elle est facile et rapide et peut être faite en un instant. Elle sert de plat de secours si le chat renverse la pâte à anjero (la bonne excuse si vous avez oublié de préparer la pâte à anjero la veille). La Malawah est servie avec du ghee (subag) et bien saupoudrée de sucre. Ce qui la rend parfaite pour rompre le jeûne pendant le Ramadan. Malawah est aussi servie avec des plats salés comme suqaar, been dallac (dallac bilaash), et des ragoûts. Elle n’est pas aussi absorbante que l’anjero mais ce ne sera pas un inconvénient si vous maîtrisez l’art de fiteeys et de rifaadiq. Fiteeys c’est rompre n’importe quel pain (rooti, muufo, anjero, malawah) en tous petits morceaux et les mettre dans un ragoût. On le fait habituellement avec du pain rassis qui a durci et moins absorbant. Rifaadiq c’est passer à un tout autre niveau. Vos mains deviennent un blender et vous réduisez en purée la nourriture. Vous ne savez pas ce que vous mangez, mais c’est excellent! Zahra Kassim nous a donné la recette de la Malawah Enrichie. Elle nous a aussi suggéré de servir malawah avec du lait de coco. Dans sa version, le lait de coco est cuit avec du sucre puis versé sur la malawah. 1. Place the Malawah ingredients in a blender. 2. Blend for 1 minute (or until there are no lumps in the batter). 3. Let the batter rest for at least 30 minutes. 1. Waxyaabaha malawaxa laga sameynaayo ku-wada rid makiinadda. 2. Hal daqiiqo qas. 3. Nus saac dhig (haddii kale malawaxa wuu adkaanaayaa oo margi oo kale ayuu noqonaayaa). 1. Placer les ingrédients de la Malawah dans un blender. 2. Mélanger pendant 1 minute (où jusqu’à ce qu’il n’y ait plus de grumeaux dans la pâte). 3. Laisser reposer la pâte au moins 30 minutes. 1. To get 15 malawah, scoop ⅓ cup of the batter. We used a 10 inch (25.4 cm) pan. 2. Tilt and rotate the pan so that the batter covers the bottom of the pan and runs all around the edge. 3. Cook the malawah for 2 minutes on medium heat. If your malawah is thicker, you will need to cook it longer. 1. Si aad u-heshid 15 malawax, waxaa birta ku-shubtaa ⅓ koob oo cajiin ah. Waxaan isticmaalnay bir cabbirkeeda yahay 10 inch (25.4 cm). 2. Birta wareeji si uu cajiinka birta ugu wada fido. 3. Dab dhexdhexaad ah, 2 daqiiqo ku-dub. Haddii malawaxaada uu culus yahay, waqti dheeraad ah dub. 1. Pour faire 15 Malawah, prendre ⅓ de mesure de pâte. Nous avons utilisé une poêle de 10 pouces (25.4 cm). 2. Incliner et secouer la poêle pour que la pâte recouvre tout le fond et remonte sur les bords. 3. Cuire la malawah pendant 2 minutes à feu moyen. Si votre malawah est plus épaisse, vous aurez besoin de la faire cuire plus longtemps. 1. 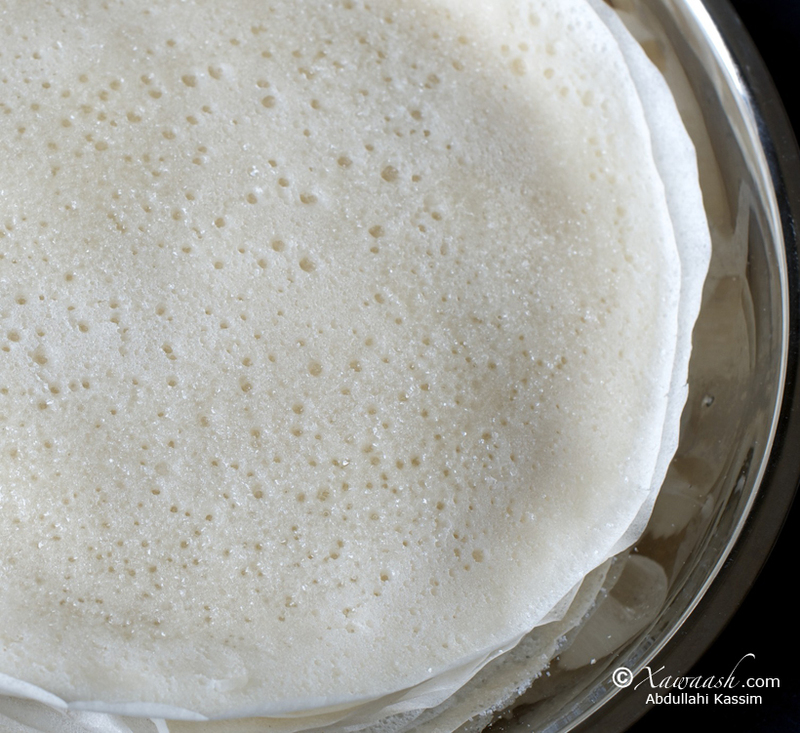 Smear the malawah with 1 tsp of good quality coconut milk. 2. Sprinkle with sugar. 3. Roll. 1. Waxaa marisaa 1 qy (qaaddo yar) oo caano qumbe ah. Qumbaha waa inuu yahay nooc fiican. 2. Sokor ku-shub. 3. Isku duub. 1. Étaler un cc de lait de coco de bonne qualité sur la malawah. 2. Saupoudrer de sucre. 3. Rouler. 1. Melt 2 Tbsp of unsalted butter. 2. Add ½ cup of orange marmalade. 3. Add 1 cup of orange juice. 4. Add 1 Tbsp lemon juice and cook for 8 minutes on high. 5. Place the malawah in the sauce and cook until the sauce thickens. 6. Flip the malawah half-way through the cooking. 1. Dhalaali 2 QW (qaaddo weyn) buuro ah. 2. Ku-dar ½ koob malmalaaddo oranjo. Malmalaaddada waa inay tahay nooc laga sameeyay qolofta oranjada. 3. Ku-dar 1 koob casiir oranjo. 4. Ku-dar 1 QW (qaaddo weyn) liin dhanaan. Siddeed daqiiqo dab sare ku-kari. 5. Ku-rid malawaxa oo ku-dhex kari ilaa uu sooska ka culusaado. 6. Malawaxa geddi marka aad sooska ku-dhex karinaysid. 1. Faire fondre 2 cs de beurre doux. 2. Ajouter ½ mesure de marmelade d’orange. 3. Ajouter une mesure de jus d’orange. 4. Ajouter 1 cs de jus de citron et cuire 8 minutes à feu fort. 5. Poser la malawah dans la sauce et cuire jusqu’à ce que la sauce épaississe. 6. Retourner la malawah à mi-cuisson. What is round, goes around, comes around. Ce qui est rond, part faire un tour, et revient à la maison. I love malwax, nd my husband does too. We eat perhaps once a week for breakfast or sometimes light dinner. I never knew there was so many ways to make it. This is awesome, i usually serve it with sugar nd butter, but i hve to give the crepe suzette a try… Thnk youuu. Our family loves youuu!!! It is great to know that you liked this recipe. You can also try it with fresh strawberries and stawberry jam. Thank you very much. Walaasheenna qaaliga ah aad ayaa u-mahadsan tahay. Ilaahey ha-inoo aqbalo ducadaada. Intaas iyo in ka-badan ayaan kuu rajaynaynaa. asc, dhamaan walalaha xawaash.com. walalayal dhab ahanti aad ayn idinkugu mahad celineyna sida quruxda badan ee aad mar waliba u mujisaan dadaalkiina, waxan idinka codsaneynaa anigo matalaya team badan oo reer muqdisho ah oo ku taxan xawaash in aad noo soo galisaan sida loo sameeyo pizza, waxan rajeynaya in aad codsigeena suura galin doontaan insha’alaah, mahadsanidiin. Walaal ayaan, idinkaa mahadda mudan. Hadduu Eebbe raali ka-noqdo codsigiina waan soo dedejin doonnaa. Salaan diiran ayaan idiin soo diraynaa martida muqdisho naga daawata oo dhan. Nabad iyo caano Eebbe ha idinkugu deeqo. Laba nooc sambuus ayaa ku-jira. Mid meeshaan ayaad ka-helaysaa http://xawaash.com/?p=3461, kan kalena halkaan http://xawaash.com/?p=1267. maasha allaah, Ramadan is on. this year, inshaallaah, i will be the queen of iftaar. thanks to you… jzk kheir. Thank you for commenting regularly. You can try it with strawberry jam. Butter gives it a good flavour but if you are not using butter, then don’t add any oil. Asalamalaikum. I love this recipe! Thank you! It’s really easy to follow, even for a fifteen year old like my self. Just in time for Ramadan too. Inshaallah, I’ll be fasting for the entire month. 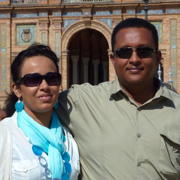 Khadra we are very, very proud of you. You make all our efforts worthwhile. Thank you for the nice comment. Thanks brother and sister, for responding to my request(malwah). What I saw exceeded my expectation and imagination superb. Is it possible please before Ramadan if you show how to make pizza. One more request please Somali shahi and qahwah and bisbas. You are most welcome, Adan. God willing, we are planning to make the pizza before Ramadan. We will do the rest of your requests in the near future. Thank you for your comments. I can’t believe how small this world really is In my country, Romania, during times of fasting we make the basic malawah (called Clatite de post – crepes for fasting), with the difference that we cook them on both sides. I never used exact quantities till now, but I’m going to make your recipe tomorrow for breakfast. Although I’m not Muslim, Ramadan has a very special meaning to me and even though I’m not fasting I plan to try many new Ramadan-specific recipes from around the world. I’m never disappointed when I visit your blog and I’m so happy to have a Somali dish that I can add to my collection of Ramadan recipes. 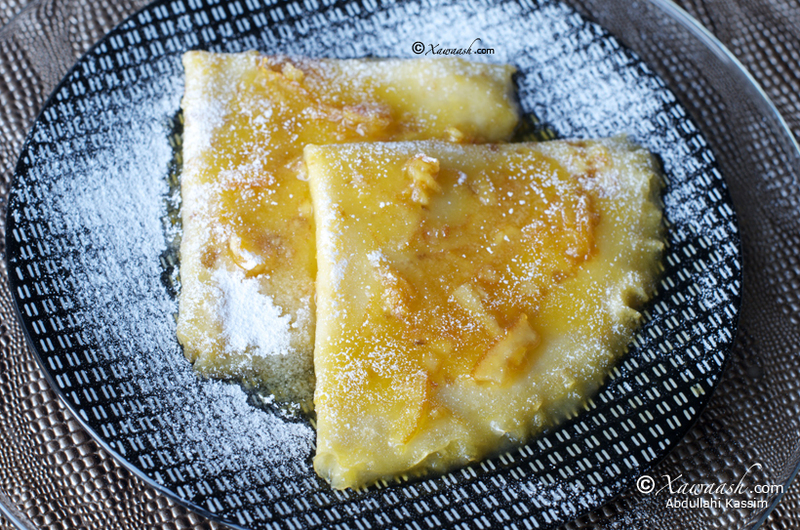 I’m going to try the malawah with coconut oil + sugar, creamy coconut milk + sugar and will also attempt the crepe suzette style Many thanks for sharing the recipe. Ramadan Kareem to everyone! Mulţumesc mult! We were fascinated by the similarities between the malawah and the Clatite de post. Thank you very much for sharing that information. What is particularly amazing is that both are used for breaking the fast. Thanks again. Adigaa mahadda mudan walaal. Waan ku-faraxsannahay inaad ka-faa’iidaysanaysid xawaash. Mahadsanid. Absolutely delicious! I couldn’t stop myself eating The ones with coconut oil and sugar were great, but I especially loved the ones with coconut milk inside and out. No patience to make crepe suzette, I was eating them as soon as they were done From now on whenever I make crepes I’ll definitely want some with coconut milk, what a great combination! I followed the exact amounts, but the batter came out a little too runny, so I added some more flour and they came out perfect. Thank you for the recipe. We are glad that you liked the malawah. 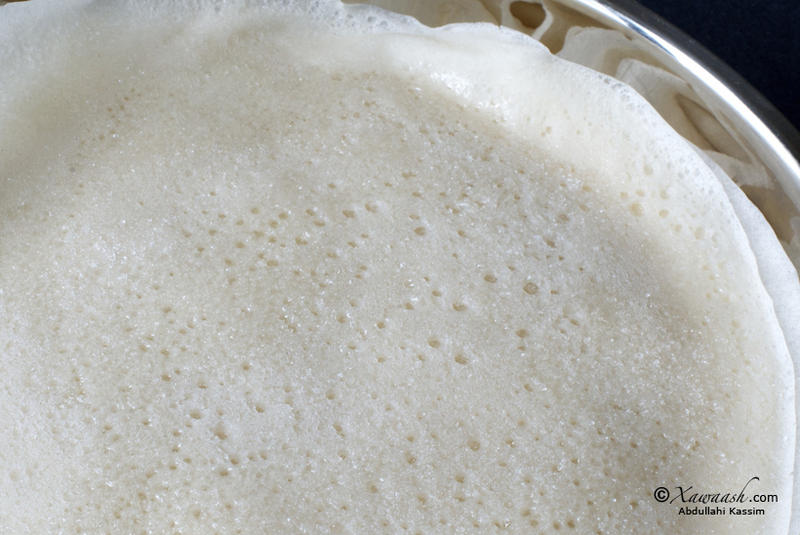 We made the batter runny so we could get thin crepes by swirling the pan. This is particularly important for the plain ones that are cooked on one side only and without butter. When we made the batter less runny, the plain malawax tasted doughy. For the second type of malawah that we made (cooked on both sides with the addition of butter) it is perfectly ok to make the batter thicker. Mulţumesc mult! Thank you. What is the traditional way of serving the Clatite de post? Is it mainly a sweet dish or is it savoury? Adigaa mahadda mudan walaal. Hooyo nagu salaan, Ramadaan Kariim inoo dheh. Hadduu Ilaahey yiraahdo waan soo gelin doonnaa, wax yar inoo samra. Adigaa mahadda mudan walaal. Qayr ayaan kuu rajaynaynaa. Waa ku-mahadsan tahay faalladaada. Annagana waan ku-faraxsan nahay inaad jeclaatay goobta Xawaash. Ciid Wanaagsan. Adigaa mahadda mudan. Raga Soomaaliyeed waa dad karti leh, ee waa laga qarsan jiray sida wax loo kariyo . Maantase wax walba waa la-shaac bixiyey. Mahadsanid walaal. Wow the last one surprised me i will definitely try it. By the way i love love you guys. Everything you do is absolutely TASTY n BEAUTIFUL. I cooked a few of the food n my family could not stop talking about it. Anyways big thanks:-) may ALLAH SWT give u both infinite happiness AMEEN. Thank you very much for the wonderful comment, we appreciate it. We are happy we could help. May God give health and happiness. asc walaalaayal run ahaantii aad iyo aad baad umahadsantihiin waxaan ilaahay idiin ka baryayaa inuu xoogiina iyo cimri giina iyo cibaadadiina iyo camalkiina ba idiin barakeeyo dadaal kiinana uu idinla garab galo ilaahay haydin barakeeyo walaalayaal runtii waxaad muu jiseen dadaal aad ubadan oo aan lasoo koobikarin ilaahayna haydin ku garab galo idinka iyo intii adikala qayb qaadatayba alaah haydin xafido amiin amiin wsc . Walaasheenna qaaliga ah Roda, aad iyo aad ayaa ugu mahadsan tahay faallada iyo ducada qiimaha badan leh. Aad iyo aad ayaad nooga faraxisay. Dadaal intaas ka badan ayaad u qalantaan. Mahadsanid walaal. assc wa raxmatullahi wa barakaatu, waad ku mahdsantihiin sida qurxuda leh ee aad usoo bandhigteen cunnadaan , oo aad u qiimeyseen .waxaa keliya iga maqnaadey muufo marko. grazie. Adigaa mahadda mudan walaal. Waan ku faraxnay inaad jeclaatay malawaxa. Muufo Baraawe mar hore ayaan soo gelinay, hadduu Eebbe idmo noocyo kalena waan soo gelin doonnaa. Mahadsanid. Thank you for your comment. You can use butter instead of the coconut milk, and for the marmalade use any type of jam you like. The nuts are not a must, you can do without them. Salams! This was an amazing couple of recipes for Malwaax! My 21 year old self was frantically looking for a recipe so I can surprise my mom for breakfast and I can never seem to remember the measurements without always asking hoyoo! Life saver post! I love your website, I’m in the process of learning about our beautiful culture and it really is showing here! Wil definitely favorite your website for future recipe needs may Allah swt put barakah in your work and reward your efforts! Thank you very much for your amazing comment and God bless you for surprising your mom. We wish all the best.